About Donovan's Pest Control, Inc.
Diamond Certified by American Ratings Corp.
What people say about Donovan's Pest Control, Inc.
Quite simply the BEST! Love the fact that I get a emailed report for every visit. When I need extra service between visits, they are quick to respond and I can easily get on the schedule. I couldn't be happier. Yes, you've done what you can for certain garden pests, making life easier for me! Tech is always very cheerful and polite when he visits. Kevin came in on time, demonstrated his professional curtesy and respectful to our house, and provided candid advice and plan options of dealing with our ant issues around the house. Highly recommend Kevin and his company to others! Thank you very much for your kind words. We will pass them along to Kevin. Easy to schedule inspection. Arrived on time. Provided a comprehensive written estimate. Delaney is the best! Donovans has always been super responsive and helpful! Abdel was prompt and efficient He did a great job assessing the reason a new critter got under the house I appreciate his attention to detail Thank you. Kevin did excellent job sealing the access entry points. He explained what he was going to do in detail. Thank you so much for your kind words regarding Kevin's performance. We will share them with Kevin. Great service. Attention to detail. Good follow up. Kevin from Donovan's came out and evaluated the pest problems on my property. Also gave helpful input on how to help mitigate some of it. I've signed up for their regular pest services. Donovan's has succeeded in keeping the ants outside...OUTSIDE! Continual battle.....but, so far so good! Employees are always very friendly and courteous and listen to pest concerns.....and SOLVE! As always a job well done! Thanks. I got one of these a few weeks ago. All is good. Consistently fine service over many years! Always happy with donovans. They get the job done carefully and courteously. Thank yo so much for your kind evaluation! Always call to remind us of the service day and very courteous. In the past several years I have used the services of Donovan's Pest Control. They were always quick to respond to my needs. They sent a knowledgeable technician to my home who performed a thorough inspection and presented a proposal for treatment. The treatment was always effective and eliminated the problem. The technicians who visited the site were always professional and willing to accommodate my needs. I recommend Donovan's Pest Control without reservation. You guys are one of the most professional team I have met. Kelvin did an amazing job for inspection and taught me the kinds of pests I had. Delaney was here the last service. He listened to what my issues were, and handled all of them. Great service... Thomas is our technician and he always checks in with us about how the flea situation is doing... Donovan’s always calls ahead to check if the scheduled service works with our schedule...We appreciate this very much...We had the worst flea problem and now since Donovan’s comes out to do monthly maintenance spraying we have no flea issues at all ... Thank you so much Donovan’s ..Our dogs are very happy also! I like the service and my technician. Sometimes the scheduling is difficult. I takes a few phone calls because I like to be home during service.d. The technicians that come to do my regular monthly maintenance are great, friendly, and do a very good job. I give them 5 stars! I am very happy with the service I have received. Your service technicians have been on time, courteous. I.
Courteous and effective service. Quick to respond and able to resolve our pest issues. Friendly, reliable service ... always there to help resolve my problems - ants, yellow jackets, rodents, etc. This is based on 15+ years experience as a happy customer. Great service! Abdel, who serviced my property was extremely, knowledgable, helpful and polite. I would like to request him for all future service calls. Thank you! Maria Giulianetti. very good and efficient. always on time. You all are great. From the office to the people who do the service. I've recommended your service to several of my friends. Thank you for your kind words! We really appreciate your feedback. In one visit Delaney eliminated the ants we had been unsuccessfully battling for two weeks. Thank you! The service they provide is very professional I’m very pleased with the work thank you guys. Quick answers to any service call and beyond. Resolving any issues. Extremely professional staff, very friendly and courteous throughout the whole team. Thank you Team Donovan! The technician always arrives within the time given. He is friendly thorough and makes recommendations when necessary. The service person was very knowledgeable, polite and helpful. Thank you. OMG, you guys are just the best! Have provided excellent service for us for 15 years. My go to exterminator is Kevin.Kevin is excellent! We have issues with ants and Kevin takes the time to take care of the interior and exterior of my house. I previously had Terminex and they were awful. They sprayed around the kitchen where we eat! I had to stop the exterminator from further service. I ended my contract with Terminex. 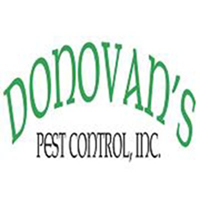 Kevin at Donovan's is knowledgeable and takes the time to deal with the pest issues. Thank you Kevin!You are fantastic and represent your company very well! We have been doing business with Donovan's Pest Control since 2014. All employees are polite, knowledgeable and answer all questions that we have. They come to the house within a two hour time frame each and every time. The technicians are well trained in their field of expertise.